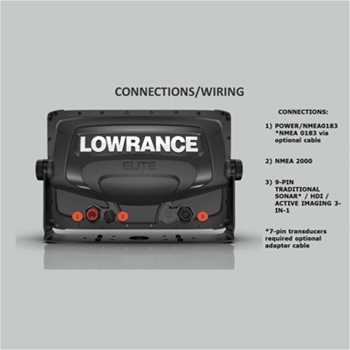 The Lowrance Elite Ti2 and Active Imaging 3-in-1transducer provides crisp, clear and detailed sonar images. A bright 7”display with internal 10Hz GPS Antenna, detailed lake maps, NMEA2000, wireless networking, smartphone notification and much more! 7” GPS with 3 in 1 Active-Image Sonar Transducer! 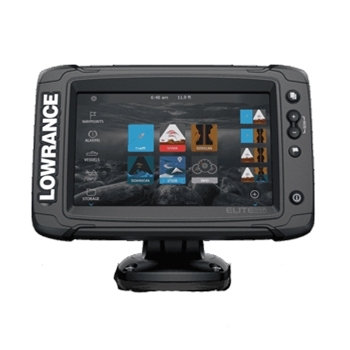 A bright 7" touchscreen display, detailed mapping for the US inland lakes, Wireless networking, NMEA 2000 and more! This combination GPS/Fishfinder offers all you could want or need at an affordable price point! 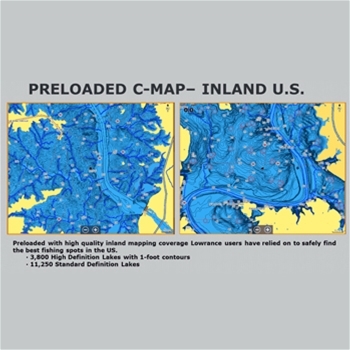 Included with every Elite 7 Ti2 is detailed C-MAP inland lake chart covering over 4,000 inland lakes with up to 1 ft. contours making it easier to find fish hotspots like ledges, drop offs, and more. The Genesis Live functionality uses digital depths and allows the user to create high definition mapping with ½ ft contours and allows each end user to contour density, depth and safety shading color palettes, and more. Create detailed Genesis Live maps in real time as you fish and save them to a micro-sd card for later use! 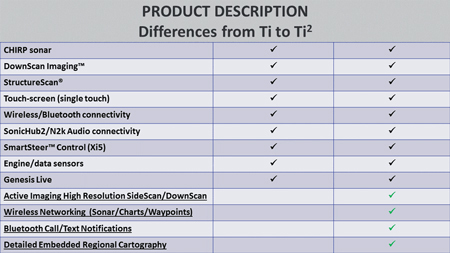 The Elite-7 Ti2 can also be paired with C-Map Max-N+ charts, Navionics + or Navionics Platinum+ for even greater detail. With the addition of one of these charts you will also get the added benefit of automatic route planning, a menu activated feature that plots the shortest and safest course based on your boats specs. Built with 3 in 1 active imaging, the Elite 7 Ti2 when paired with included transducer will provide M/H CHIRP, DownScan and StructureScan for exceptionally detailed underwater images. See below and to the left and right of your vessel in near photo like detail and see fish holding areas like rockpiles, standing timber, ditches and drop offs like never before. The Ti2 also allows touch screen control of Power-Pole anchors and MotorGuide Xi5 Trolling Motors(with a MotorGuide PinPoint Gateway). Whether you’re fishing a tournament or just enjoying the day on the water with friends – the Elite 9 Ti2 is a top contender for chartplotting and fishfinding! Wireless Networking and Communications abound in this combination unit. Want to pair two Elite Ti2 units together to share waypoints routes and tracks? It’s simple with wireless networking. Now you can share this information between 2 Ti2 units and do it without running any additional cables! And with Smartphone notifications you can receive calls, texts and emails right on your Ti2 display. Don’t want to be bothered? Don’t worry - simply turn off smart notifications in the settings and you can enjoy a stress free day on the water! The Lowrance Elite Ti2 and Active Imaging 3-in-1 transducer provides crisp, clear and detailed sonar images. A bright 7”display with internal 10Hz GPS Antenna, Nav+ Mapping for Coastal and Lake Waters, NMEA2000, wireless networking, smartphone notification and much more!